Owing to our industrial expertise accumulated over time, we have established ourselves as a leading Manufacturer, Exporter & Supplier in the industry. 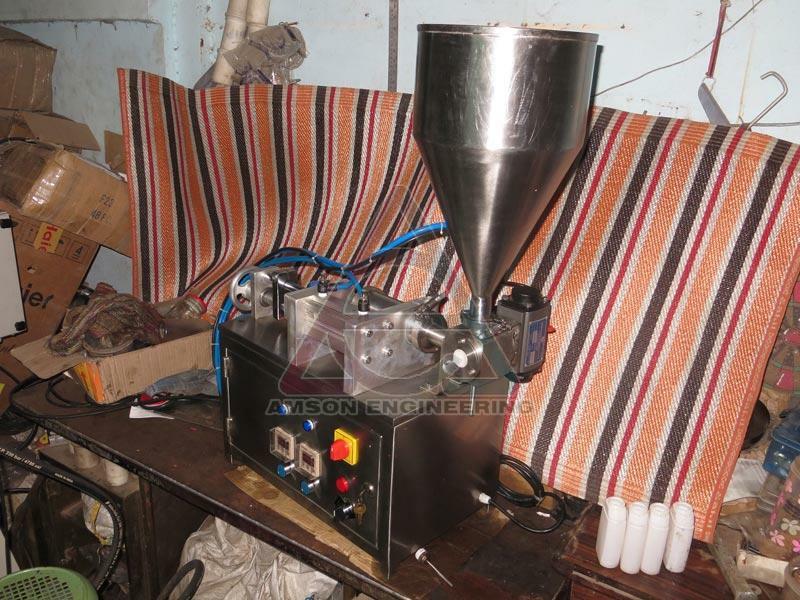 We offer Pneumatic Piston Filling Machine to our esteemed customers at attractive price. The machine boasts striking features such as light weight, strong built and durability. Our excellent distribution system enables you to get it delivered to your doorstep in no time at affordable prices. 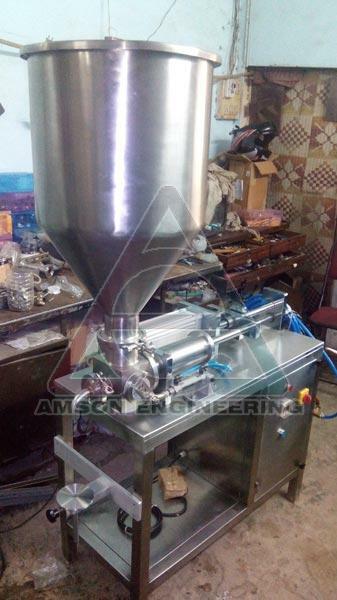 Details of Semi-automatic Pneumatic Piston Type Cream/gel/paste Filling Machine Brief about the product : The model AEPPF011000 machine can simply called as a perfect all-purpose filling machine for semi solids filling to bottles, pouches or container. 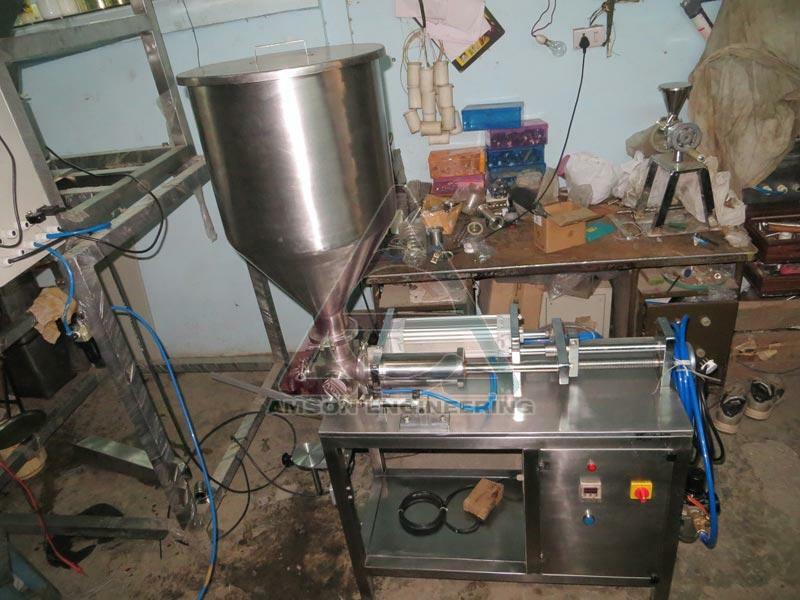 In this machine you can fill liquids, and paste/ viscous material without changing any parts. A very user-friendly model with low maintenance requirement. Here, All filling operations are done by Pneumatic Cylinders. Less rotating/ moving parts means low maintenance. High accuracy in each fill up to 0.5% of the volume. Easy to clean because of sanitary fittings. Easy change over from one product to other. 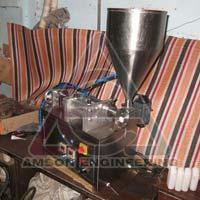 Speed of filling can be controlled easily. 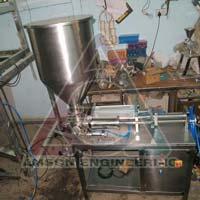 Foot pedal switch operation provides each filling at each pressing. Complete Filling machine unit is mounted on a strong stainless steel square pipe fabricated frame structure with a top plate. 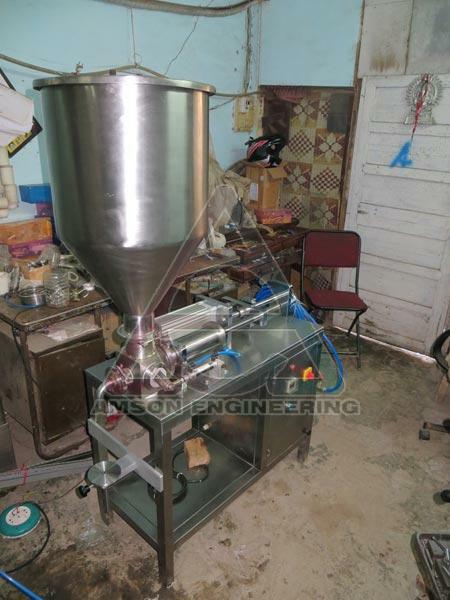 A horizontally assembled Piston Barrel unit attached to a Pneumatic Cylinder is the main part of this machine. 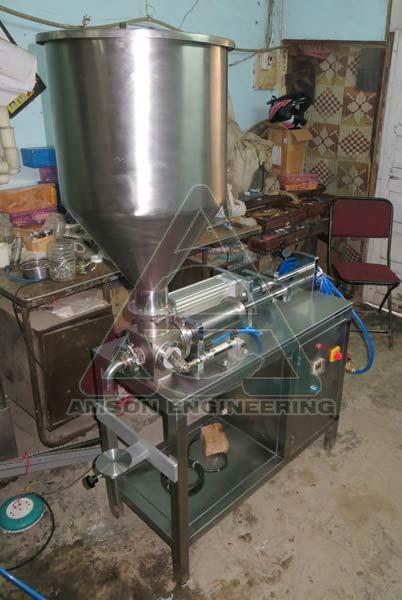 Other parts are, A rotary direction control valve actuated by a pneumatic rotary actuator, guide rod, Fill nozzle, Top side mounted Stainless steel 40 liter capacity product hopper, a volume adjusting screw at the back side. An inbuilt control panel box is provided with the machine to perform all the operations in sequence. When the mains are ON, the only operation manually done is to press foot pedal switch and to hold the pouch or bottle below the nozzle. A perfect measured filling and spreading is occurred. 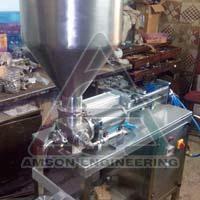 This fill time and stop time also can be set by you as per filling speed/ nozzle size/ volume to be filled. The volume setting is also made very easy in this model. By rotating and locking the set screw at the back side of barrel can provide accurate volume in grams/ ml. 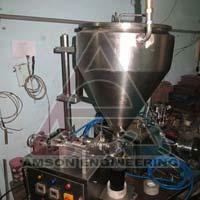 Once the weight is set as per viscosity, it is unchanged until it is changed manually. The machine will be requiring 220 VAC 50 Hz Single Phase electricity to operate. Air compressor with sufficient capacity is required for a smooth working. A capacity of 3 HP, 6 CFM output capacity Air compressor which can provide at least pressure @ 6 Kg/Cm2 is best suitable in this unit. A maximum output of 20 fills can be achieved in a minute. 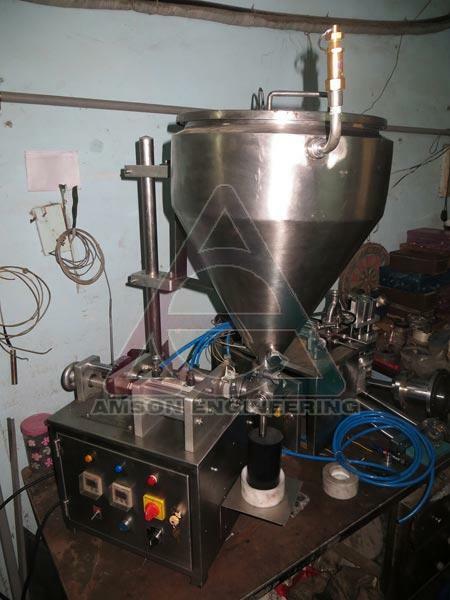 Complete GMP Model suitable for Pharma Applications and food industries. 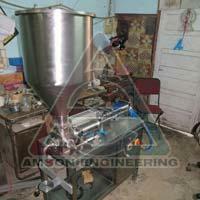 Any material from free flowing liquids to hard pastes can be filled by same machine. High accuracy in each filling. Easy to clean with the help of dairy type tri clover (tri-clamp) fittings at all filling parts. Machine weight - 100 kgs approx. All Material contact Parts are in SS304 grade, finished to mat. Output - Maximum 20 fills per minute@ 500 ml/grams. Compressor required - 6 Kg.cm2, 4 cfm. Inbuilt Panel Box with timers switches and valves. 40 Liter stainless steel Hopper comes with this machine. Adjustable stroke and fill volume with a hand wheel provided with the machine. Electricity required - Single phase 220 VAC, 50 Hz. Labor required - 1 semi-skilled.